I probably have a past life that doesn`t bear talking about, but ... well ... there`s no point talking about it. I was found by a kind lady on the steps of an apartment house. She tried to find where I belonged, but all they people inside could tell her was that another budgie had been found there yesterday. So she took me to the animal shelter and sure enough, the other budgie was there too. The shelter became worried about us and called Mickaboo. 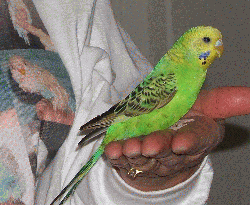 Mickaboo took us to a vet, but the other budgie was very sick indeed. He didn`t make it. But I`m a tough little budgie -- witness the fact that I have lost one of my toes and almost all of my toenails at some point in the past. But I am a sweet and gentle little bird, in spite of my hard life. So I am still going strong, and looking for a real home of my own. If you think you`d like to live with a gentle, tough little budgie with a mysterious past, I`m your guy!